A century ago, Gillette ran ads in newspapers touting American soldiers of World War I using their product: the "clean fighters" of the Allied forces "fighting for clean ideals." They were "millions of big, strong-limbed super-men ... fighting to save Freedom." Today, there are no strong-limbed men. There are bullies and sexual harassers in need of castration. Go ahead; try to tell us we're exaggerating. NPR's Tovia Smith lovingly introduced Gillette's latest ad campaign saying, "The first half of the ad portrays males as boorish, sexually harassing women, mansplaining and bullying." The ad insists on Social Change. The narrator proclaims: "We can't hide from it. ... We can't laugh it off, making the same old excuses. ... And there will be no going back." A long row of apparently loathsome backyard dads stands in front of a long row of smoking charcoal grills, and the dads echo the excuse "Boys will be boys." Because somehow, in the last century, troglodyte men were bullies who never stopped bullies and never taught their boys to respect women (including their mothers? and sisters?). This isn't selling razors. It's selling an obnoxious, boorish political cartoon. Gillette would protest that the ad says "some" men, not all men, are awful. But it is mansplaining to all men, assuming they are all dim and in need of an education. 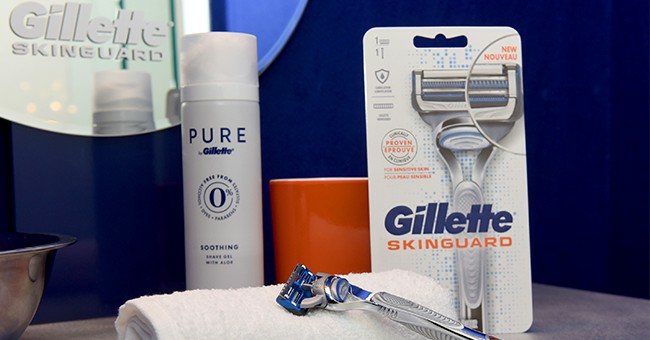 So it's comical that after these insults about male stereotypes, the website dedicated to this ad campaign insists, "From today on, we pledge to actively challenge the stereotypes and expectations of what it means to be a man everywhere you see Gillette." NPR loved it. Smith wrote, "Call it a new kind of corporate machismo, volunteering to march bravely ahead into the culture wars." This may be the only time in NPR's history that it has applauded "machismo." For grins, try to imagine Gillette marketing its Venus line of razors to women in this way. Imagine the reaction if these geniuses were to run an ad against "toxic femininity," saying the time is over for women gossiping and bullying women. NPR would go into spasmodic convulsions. The bra burners would take to the streets. Women are presumed to be the victimized gender -- oppressed by men (yuk! ), not poisoned by testosterone. The contrast of the men's ad with a Gillette Venus ad from October is amazing. The narrator actually says: "It's time to do things a new way -- your way, without conforming to conventions so that your skin writes the rules. Because no one gets an opinion on how you live your life, or why you shave." Yet more political sermonizing, and now the polar opposite of Gillette's male-bashing campaign! The ad goes on to brag about how these ads are made by a "female-led team" with women behind and in front of the camera. "We're celebrating every woman and her skin," the narrator says. Celebrating "every woman"? These women are even celebrating the bullies? Well, their skin "writes the rules," apparently.